King’s High School Old Boys’ Association, established 1939, believes that every old boy has something to contribute to his school and to others who are sharing the King’s experience. 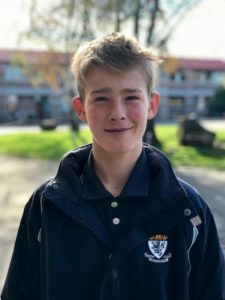 While sitting the scholarship exams, he was also sitting nine NCEA level 3 exams and competing in the New Zealand secondary schools athletics championships 800m, 4400m relay and the 1500m running events. Making the achievement all the more remarkable, he is still only 16 and he had skipped year 12 to sit the exams that usually challenge year 13 pupils. ERO did a great job here capturing the essence of our school. We do have a highly inclusive culture. Every student is a King’s Man and every student is valued equally. One of the Year 9 students ERO spoke to said it best when he was asked about his background and heritage, he replied, “It doesn’t matter Miss, I am a King’s Man and I am part of the King’s brotherhood. That is what really matters”. ERO noted there are excellent outcomes for ALL our students. Our NCEA pass rates across Levels 1, 2 and 3 averaged comfortably in excess of 90% placing us 2nd amongst State Boys’ Schools nationwide. The data really does tell the story. On the sports field, we have continued to shine. Three gold and three bronze medals at the National Athletics Championships including an NZ record in the U16 4 x 100m relay, the Small Bore team finished 4th in NZ, the Touch team placed 5th in NZ, the 1st XI Hockey team gained its best ever result in the prestigious Rankin Cup, placing 6th in NZ while the 1st XI Football team had its best national finish since 1992, coming 15th in NZ. At the same time, the 1st XI Cricket team qualified for the Gillette cup finals, ultimately meaning a top 6 finish in the country while the Junior 1st XI Cricket team finished 5th in NZ and the Junior 1st XI Football team lost their national final to place 2nd in NZ. On an individual level, we celebrated 16 National representatives or national title holders. In the cultural arena our young men continue to flourish, a New Zealand Secondary School Choir member, a 2nd place in the prestigious Nga Manu Korero Speech Competition (only the 2nd time in the competition’s history a South Island student has podiumed at this national event), He Waka Kotuia finished in 26th place at the National Kapa Haka Competition, including an impressive 13th place in its command of Te Reo. There was gold medal success at the Otago Rockquest competition and one of our young men was part of the band that won the “Country entertainer of the year award” at the 50 000 strong Tamworth Country Music Festival in Australia. It is with mixed emotions that I am communicating my decision to take up the role of Principal at Dilworth School in Auckland from term 2, 2019. 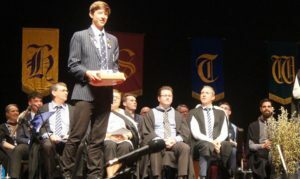 It has been my privilege to be the Rector of King’s High School for the past ten years. I have poured myself into our school and the lives of the young men I have had the joy of working with and for. I have forged lifelong friendships with many of the outstanding people that have historically and currently make up the superb teaching and support staff at King’s. For all that I have given I received so much more in return. I am sincerely grateful for the generous support of the Old Boys and the many ways in which you contribute to the school. I look forward to catching up with those of you who live locally in the months ahead. I can only hope that my Dilworth experience will be as rewarding and enjoyable as the time that I have spent at King’s. competed at Otago secondary schools cross-country (2018). 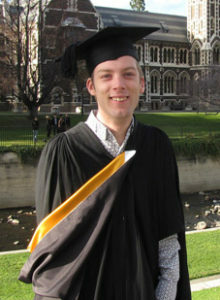 Otago Daily Times 2012 Class Act Award Winner and 2012 Kings Dux, Shaun Markham has graduated from the University of Otago with a master of economics degree, with distinction. He was born with athetoid cerebral palsy, which affects his speech and fine motor skills. But while the condition was ‘‘part of me, it doesn’t define me’’, he said. King’s teacher Garry Kyle taught him economics throughout his five years at school. 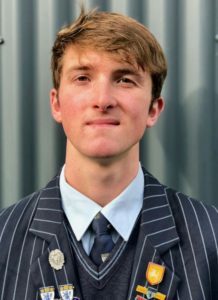 Mr Markham showed his ‘‘potential and determination in his first week’’, by ‘‘ditching his wheelchair and practising for weeks’’ until he could ‘‘walk independently up the stairs’’ between floors in the classroom blocks. ‘‘Each year, his skills and performance increased [in economics]. ‘‘We have kept in touch throughout his university career and it has been a great delight to watch his progress,’’ Mr Kyle said. Mr Markham also loves sport and athletics and competes regularly in shot put and discus. A keen cricket fan, he also came on as a bowler during a university staffstudent cricket game last year. Congratulations also to Y9 Oscar Cameron who has been selected in the National U14 Boys Basketball Squad to tour Melbourne from the 7th – 12th of June 2018. Oscar was selected for this tour team from the recent National U14 Talent Development Camp held in Rotorua in the April school holidays. This is the start of the Development Pathway, and is part of a 6-Year Junior Programme with the focus on developing our young athletes into the country’s future stars. 80 athletes from all over New Zealand attended the camp, with only 20 gaining the opportunity to travel.